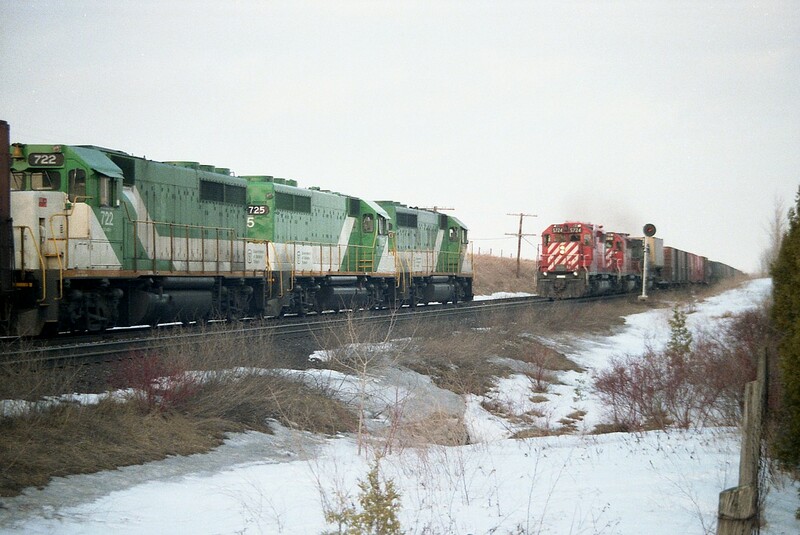 Railpictures.ca - A.W.Mooney Photo: Back in the days when CP was running power-short and using everything they could get their hands on; they ‘borrowed’ GO Transit power on weekends to help out. Here is a solid set on an eastbound train, GO 723,725 and 722 meeting westbound CP 5724, 5916 and B&O 3733 as witnessed at the east end of the siding at Coakley. I used to be able to drive in over the road bridge at the Pittock Conservation Area in the off-season, but now I believe the area is gated. | Railpictures.ca – Canadian Railway Photography – photographie ferroviaire Canadienne. Caption: Back in the days when CP was running power-short and using everything they could get their hands on; they 'borrowed' GO Transit power on weekends to help out. Here is a solid set on an eastbound train, GO 723,725 and 722 meeting westbound CP 5724, 5916 and B&O 3733 as witnessed at the east end of the siding at Coakley. I used to be able to drive in over the road bridge at the Pittock Conservation Area in the off-season, but now I believe the area is gated. I say a real mystery because the SD50 and 60F’s never had that. Still the mystery remains. If you are referring to the cowl bodied C40′s, I’ve always wondered if it is some type of support structure for the full width hood, rather than the frame, that is actually subject to sag? Cant be as bad as the sag on the C40′s. Which to this day, as far as I know, a mystery. I’ve read that locomotives are manufactured with an intentional positive frame camber, which on some, flattens over time. Is the frame bent on the 723? Or is it just me?